Have you noticed our latest masterpiece, the Douglas & Gordon branch on Harrington Road? As surely one of the world’s smallest Estate Agent’s sites, Harrington Road called for some seriously innovative design. Thinking “tardis” we created a flowing interior that enhanced and evolved the D&G design language that we have developed over recent years. The branch had to be functional with clear zones such as the waiting and reception area, as well as desks and a space for the D&G staff to work in. To achieve this while maximising a sense of space, we designed seamless storage integrated within sleek, softly undulating corian walls. This ensured that D&G staff could store their property details, marketing collateral and other items somewhere close at hand without creating clutter. The light and bright colours and materials enhance the illusion of spaciousness. Pale, glossy corian, warm timber accents and a spectrum of blue hues brighten the space as well as giving the branch a cool, contemporary edge. Despite the extreme space restriction, the D&G team are comfortably accommodated and we even made space for a comfortable visitor ‘mini-lounge’. One of the most impressive elements of the site is the enormous, interactive HD media screen wall by Squint/Opera. The screen takes up the entire back wall and enables customers to interactively search properties, along with other information such as local amenities, tube stations and activities. At night-time, it illuminates the space with three different looped ‘brand art’ videos and a control pad that is operational from outside the branch is in development – enabling people passing by to browse listed properties without the need of the branch to be open. Harrington Road is the most technologically advanced and innovative Douglas & Gordon site yet. It reflects the D&G brand and emphasises just how unique and innovative they are as estate agents. 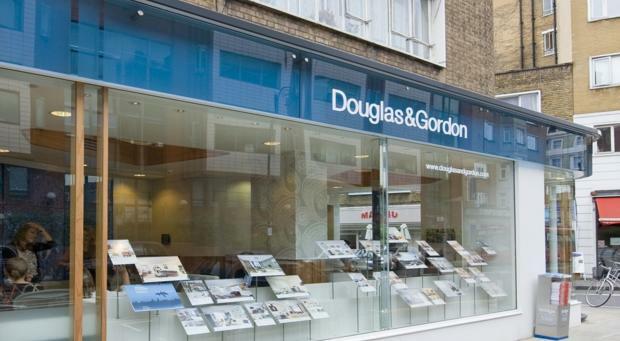 D&G is one of the largest, most innovative and well-known independent estate agents in London. They have a real reputation for being at the top of their game and the site at Harrington Road is testament to that. Want an amazing customer experience of your own? Need branding help or advice? Just want to know how ‘i-am’ can help you and your business? Get in touch!